If you are thinking about replacing a missing tooth or teeth, you've probably seen some of the advertisements on the Internet and elsewhere that promise new teeth in one day — or even one hour — with dental implants. But Rome wasn't built in a day so while timing is important, in this context planning is everything — what to do and when to do it — in order to achieve an aesthetic, functional and long lasting result. Let's take a closer look to understand why. In the beginning, dental implants found their place in dentistry most importantly for replacing missing teeth by providing an alternative solution to full dentures. The consequences of extensive edentulism can be quite devastating, the result of resorption — a melting away of tooth supporting bone. The pressure of dentures transmitted through gum ridges to the remaining underlying jawbone only hastens the resorptive process, ultimately leaving little or no bone to support removable dentures — especially problematic in the lower jaw. Dental implants, essentially tooth root replacements, fuse to bone in a remarkable process called osseo-integration ("osseo" – bone; "integration" – joining or fusion to). Not only do implants attach directly to bone, but they also stop resorption in its tracks, halting further jawbone loss. This chance discovery by Dr. Per Ingvar Branemark some forty years ago revolutionized dentistry. Even for individuals with severe jawbone loss, dental implants in this first application were used not only to attach to and stabilize dentures, but also restore facial form and function — a game changer in quality of life improvement for many denture sufferers. We've come a long way since those early pioneering days. From stabilizing dentures on the remains of edentulous jawbones, to replacing only one or a group of teeth, are different situations. For teeth that are in imminent need of removal, dental surgery now has the ability to both conserve and regenerate the tooth socket bone and the gum tissues that surround and support them. In addition when implants are placed in the jawbone, they must remain completely immobile to allow the process of osseo-integration to occur. Any force that causes even minute movement of the implants in the early healing phase can ruin the integration process, resulting in implant failure. These two elements are central to the implant timeline and will affect when and how implant tooth replacement can be achieved in different situations for the permanent replacement of teeth. When a tooth has to be removed (extracted) and replaced to maintain your health, appearance and the alignment of your bite, there are basically four different options for the timing of implant placement, each with its advantages and disadvantages. A major consideration will be the condition of the bony socket into which an implant will be placed. Although it is possible to obtain a pretty good idea of what will be encountered from x-ray images taken before the surgery, the presence of infection in the area may have compromised more bone than can be determined until the tooth is removed. It is also possible that the socket walls may be unavoidably damaged during the surgery itself — particularly if the bone is very thin or diseased. The planned timeline below takes these issues into account for the best chances of treatment success. A hopeless tooth is removed and an implant placed simultaneously, in just one surgery. The difficulty here is placing an implant into a socket into which it may not fit precisely; there will likely be space around the implant that must heal and fill with new bone. The same is true of the gum tissue that must also surround and support the implant. Incomplete bony healing and gum shrinkage can result in implant exposure and gum recession. These problems can generally be addressed by grafting procedures (of both bone and gum tissue), at the time of implant placement but the surgical site will need to be carefully protected in the ensuing weeks. This application is usually predicated upon having an intact socket with no loss of tooth supporting bone. This refers to a delay of approximately 4 to 8 weeks after tooth removal to allow initial gum tissue healing to close and seal the wound. An implant placed in the socket bone at this time ensures that it is protected by a gum tissue seal — the body's natural barrier. There will also be less possibility of gum shrinkage, resulting in a better and more predictable final aesthetic result, but there are no guarantees especially if additional bone loss occurs. To mitigate this possibility, the socket may be bone grafted at the time of extraction to limit resorption. Implants are not placed in this situation until bone healing has started to fill the socket, usually in 2 to 4 months. Bone grafting of sockets is often used to minimize any changes in the bony anatomy, or even regenerate lost bone socket walls. Placing an implant later while bone is actually growing aids the process of osseo-integration. This promotes implant stability at placement and faster healing increasing the predictability of successful integration. Waiting until the extraction site has fully healed or regenerated at about 4 to 6 months, provides the most stable foundation in which to place implants. It also allows for complete healing and maturation of sites following regeneration techniques to rebuild lost bone, when the socket has been compromised by disease. If you are having a single tooth replaced with a dental implant, it is possible to attach a temporary crown (prosthetic tooth) to it at the time it is placed, but this makes it a more risky procedure. It is therefore essential to avoid biting contact by fabricating the crown so that it does not contact the opposing tooth. This will ensure as far as possible, that the early and fragile process of osseo-integration is not disturbed. When the implant is fully integrated — generally at 2-4 months depending upon the circumstances at placement — a permanent crown can be attached to the implant that can withstand normal biting contact and force. Today's state-of-the-art implant systems enable a minimum number of implants to support a maximum number of teeth. That means as few as four to six implants can be used to support a full arch (upper or lower jaw) of fixed, non-removable temporary teeth. And this remarkable life-changing event can be accomplished in a single day, but this application requires careful pre-planning by an implant team — which generally includes a surgeon (a periodontist, oral surgeon, or general dentist with appropriate training), a restorative dentist and a laboratory technician. Evaluation of jawbone quantity, quality and health, as well as number, type and placement of implants, prefabrication of the prostheses, must all be carefully and strategically planned. This process alone may be time consuming, but is very important. Success in this application will depend on some crucial steps: The implants themselves must be strategically placed to offer the most effective support. By rigidly connecting the new temporary teeth to the implants, they stabilize each other. Think of this arrangement like a tabletop or chair supported by four legs, which are sometimes angled outward for maximum support. Properly conceived, designed and fabricated, temporary teeth can be placed at the time of implant placement. After the implants have fused to the bone, the temporary teeth are replaced with permanent ones made of more durable, aesthetic and long-lasting materials approximately three months later. The main thing to keep in mind is that you want your implant tooth replacements to be successful. 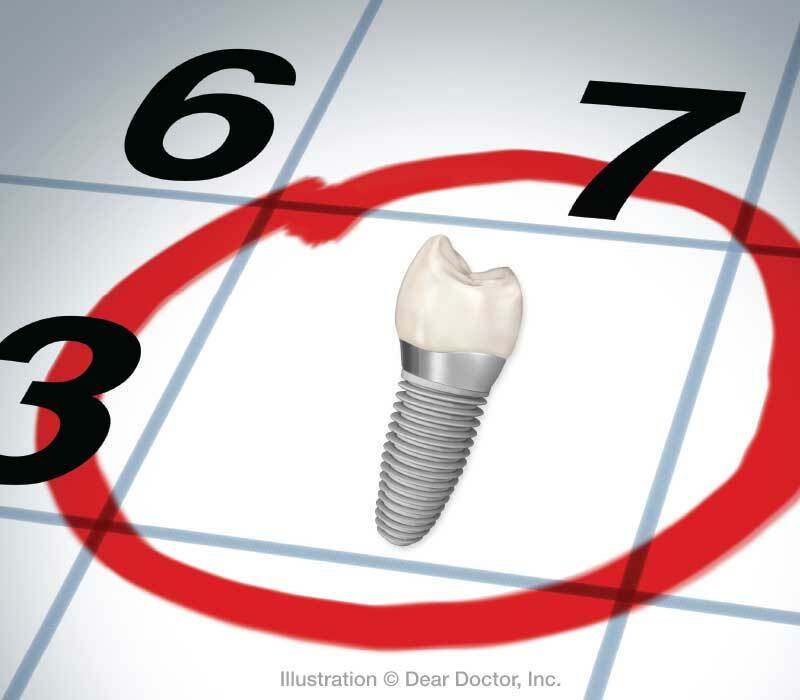 A few or even several months may seem like a long time to wait, but not when you consider how long your new teeth will last if things go right — and they almost always do: long-term success rates for dental implants according to many clinicians exceed 95%. If things don't go right, however, it is always a good idea to have that discussion before treatment begins so you understand what the worse case scenario could be. Every situation is different and having a good relationship and understanding with your dental implant team is extremely important for your peace of mind. It is possible, in the right circumstances, for temporary crowns to be attached to dental implants that have just been placed so that you can have a great-looking smile immediately after your implant surgery. However, it is also sometimes advisable to wait until the implants have fully healed before any replacement teeth are attached. Far more important than having a temporary smile as fast as possible is to have permanent replacement teeth that will last for the "rest of your life." That's what dental implants were designed to be, and why they are today's best option for replacing lost or hopeless natural teeth.